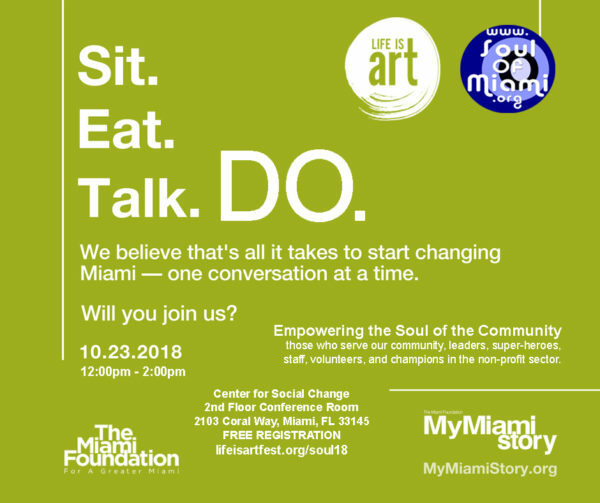 In conjunction with the Miami Foundation’s #MyMiamiStory, Life Is Art & Soul Of Miami are hosting a discussion of those who serve our community, leaders, super-heroes, staff, volunteers, and champions in the social sector. We welcome all those who work for and support non-profits to discuss how we might better serve the common good. What does your team, organization, neighborhood, community need to bring more impact, joy, health, happiness, love to those you are helping, healing, empowering? We can discuss things like cohesive capacity building, collective action, collaboration, or any other topics dear to your soul. You are the Soul of the Community and we want to hear from you. If you will attend, please also sign up as a My Miami Story conversation guest so you receive a survey after our gathering.